"Whenever I see boys and girls selling lanterns on the street.... I remember the child in the manger as he sleeps... " --- Who would ever forget this famous Christmas song? I grew up as a child caroling in our neighborhood singing this memorable song from singer-songwriter, Jose Mari Chan. 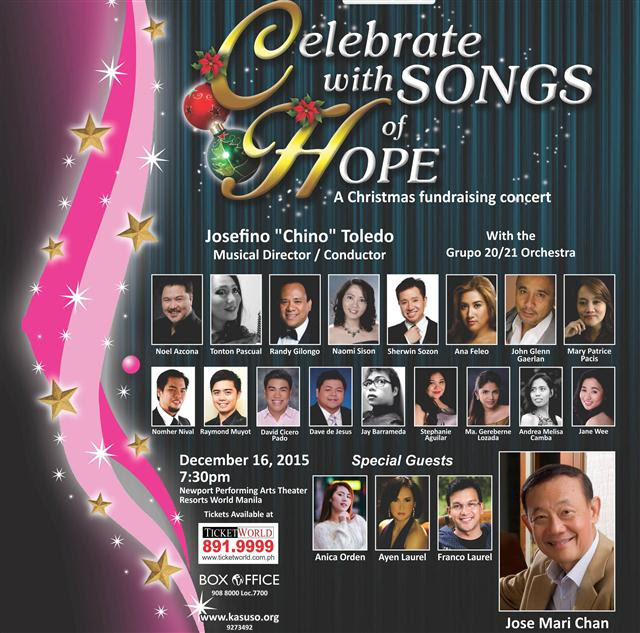 Thus, I believe it is just simply perfect when Mr. Chan confirmed that he will join the star-studded ensemble of artists who will perform at the upcoming “Celebrate with Songs of Hope: A Christmas Fundraising Concert” as part of the Breast Cancer Awareness activities for this year. Chan who received a Double Diamond Record Award for his album “Christmas in Our Hearts”, will join local artists like Franco and Ayen Laurel, Anna Feleo, Noel Azcona, Randy Gilongo, Sherwin Sozon, John Glenn Gaerlan and Anica Ordan in an evening of music and song for a great cause. This special concert is brought to you by the Philippine Foundation for Breast Care Inc. (PFBCI), Resorts World Manila, Megaworld Foundation Inc. and the Lyric Opera of the Philippines will be held at the Newport Performing Arts Theater of Resorts World Manila on December 16, 2015. The audience will be treated to a night of great music, and they will be enlightened about the symptoms of Breast Cancer, and what they can do to survive it. A perfect Christmas bonding with family and friends. 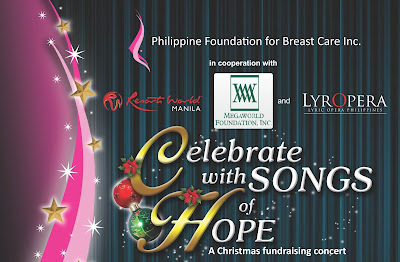 Concert tickets are available at the Ticketworld, Box Office, the Philippine Foundation for Breast Care office and www.kasuso.org. CD-R King, a known brand for providing affordable media is not just all about CDs, USBs and computer supplies but rather it has started its efforts towards eco-friendly solutions. With the provision of LED lamps and solar panels, CDR-King, your one stop media provider intends to manifest, to bring products and cost efficient means of power/electricity supply to every household. California E-bikes, a CD-R King subsidiary, open its doors in Tondo, Manila. The branch is powered by a hybrid electricity system that enables sustainable solar energy. As environmental friendly as it should be, it also aims to display similar concept Solar-kit for ones household in turn helps you save thousands of your hard earned money on monthly electric bill. California E-bike started its operation in the Philippines early 2013 with E-Scooter and later on came out with other variants of e-bikes. Today California E-bike offers more than 30 variants in more than 40 branches. Semestral break is here. Halloween is coming in a few days and we can all start to say hello to Sweet November. This only means one thing, THE HOLIDAY SEASON HAS STARTED. Aside from my birthday, this is my favorite time of the year when everyone seems to be a bit kinder, happier and positive. There is more time to spend with family and friends with the unending parties and celebrations. If you a bit short of ideas for your next get-together, Seasons, Manila Pavilion Hotel’s lifestyle restaurant welcomes the start of the holiday season with its first themed dinner buffet starting last October 23. A festive selection of Italian dishes exclusively prepared by a naturally born Italian himself, executive chef Giovanni Sias and his award-winning culinary team. 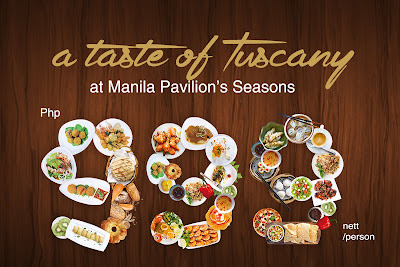 Have a taste of Tuscany here in Manila for only Php 999nett. A smorgasbord of authentic Italian specialties awaits you. Diners can choose from four live culinary stations from appetizers, noodles, grill items, down to desserts, give diners more gustatory options for a splendid repast. 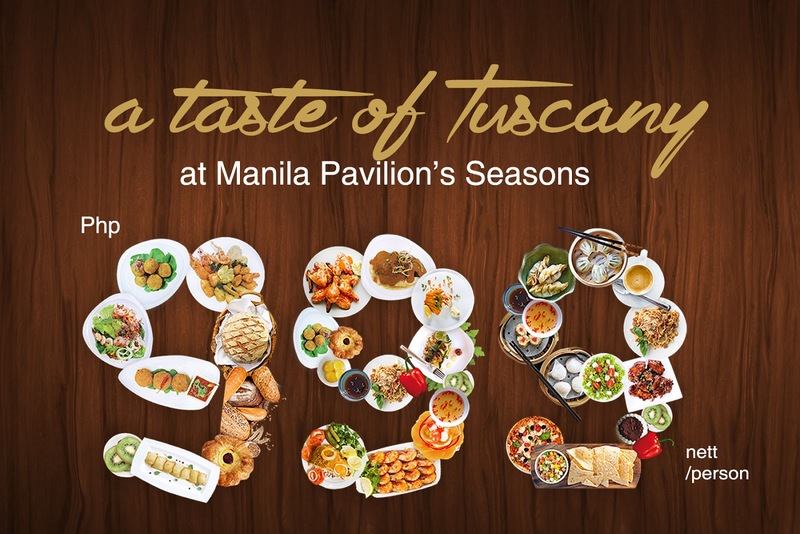 Taking from Italy’s richest cuisines, must-try signature dishes include midollo in salsa verde, stinco de agnello in umido, tortelli di zucca, fegatini di pollo and cantucci toscani among others. This is open for dinner every Friday only. For the gastronomic adventurers who want to further satisfy their cravings, they can fete also on a la carte menu teeming with dishes from around the globe. Manila Pavilion Hotel is open daily from 6am to 10:30am for breakfast buffet, 11:30am to 3:00pm for lunch and 6pm to 10:30pm for dinner. Geeking Tom is a company which is all about being proud and showing off things that geeks love such as comics, games, fandoms and more. They create unique t-shirt designs that are made of 100% cotton, thick and durable, yet comfortable to wear. The designs are screen-printed to ensure the best quality for every shirt printed. Geeking Tom is known for coming up with great original and unique designs that makes one stand out. Indeed, this collaboration of individuals have paved the way to showcase the extremely talented Filipino graphic artists. And this not just end there, if you believe that you have what it takes as a creative geek then we would like to invite you to join the shirt designing contest for the entire month of October. 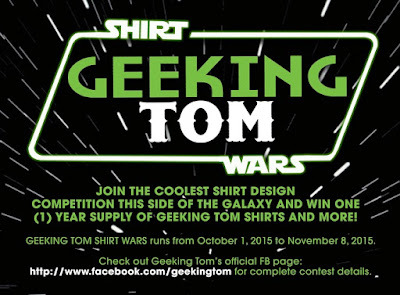 Geeking Tom Shirt Wars is a tribute to the upcoming release of Star Wars: Episode VII - The Force Awakens whose trailer hit an all time record after being released a week ago. 2. 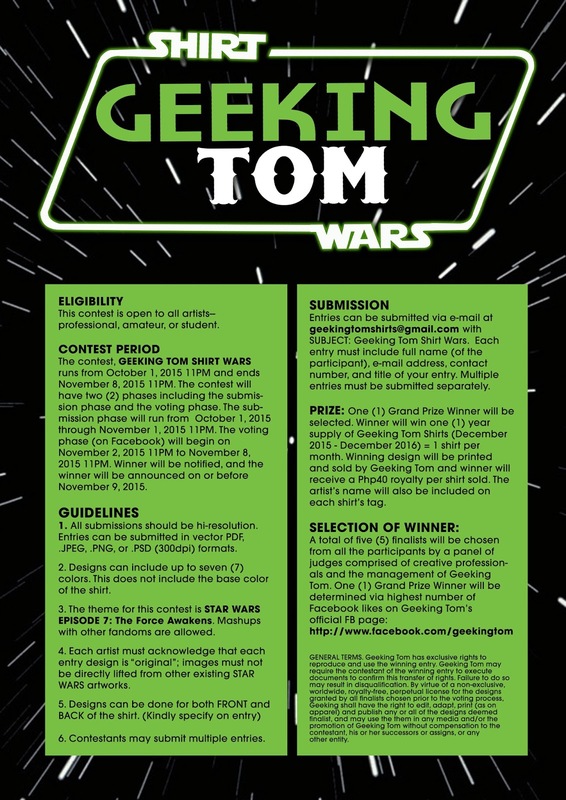 The winning design will be printed and sold by Geeking Tom, the winner's name will be included in the t-shirt's tag, and the winner will receive a PhP 40 royalty (commission) per shirt sold. 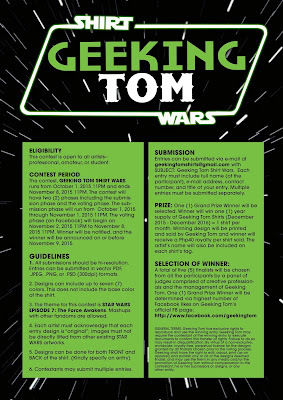 To join, the artist must submit his/her original design via e-mail to geekingtomshirts@gmail.com with the subject, "Geeking Tom Shirt Wars". Each entry must include the participants full name, e-mail address, contact number, and the title of their entry. Multiple entries are allowed, but must be submitted separately. Please see full mechanics here. Geeking Tom has a treat to all My Metro Lifestyle readers. 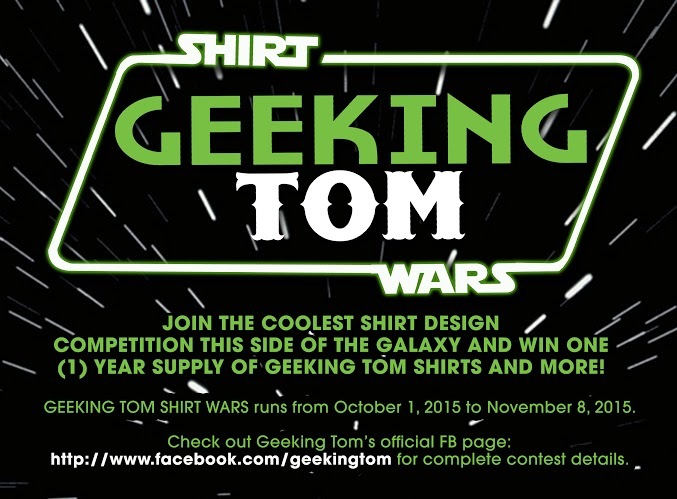 They are giving a special 15% percent discount when you purchase a Geeking Tom shirt online. All you have to do is use the promo code. "MyMetroLifestylexGeekingTom15"
So, what are you waiting for? Join now and May the force be with you! When we moved to Bacolod, it was our first step towards a healthier lifestyle. We plan to enjoy the cleaner air, away from the horrible pollution in Metro Manila. Val had been so worried about me getting very frequent asthma attacks and thus, for the sudden decision to relocate. 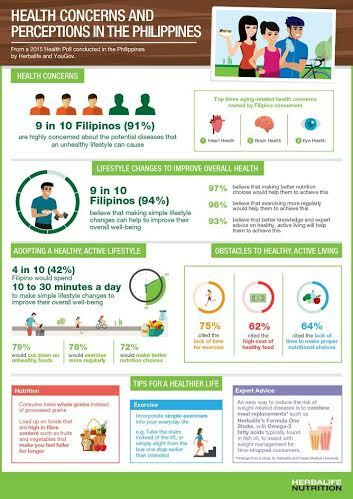 According to the health poll conducted last September 2015 by the global nutrition company, Herbalife, 9 out 10 Filipinos are "highly concerned" about the potential diseases that an unhealthy lifestyle can cause us and simple changes to the things we got so used to can make a difference. Personally, I belive that lifestyle would include the food we eat, activities we do and the places we stay. A good number of respondents expressed the willingness to make a change however, I believe that most of the respondents including me is guilty of not having started it yet. Yes, we are willing but has a long list of excuses. There are several factors that hinder us from starting such the lack of time (75%) , lack of time to make proper nutrition choice (64%) and high cost of healthy food (62%). This is something that Herbalife understands and it gives them an idea where they are needed according to Rosalio Valenzuela, Herbalife Philippines, General Manager. Now on its fourth year, the Herbalife Asia-Pacific Wellness Tour aims to deepen people’s practical understanding of the various aspects of living a healthy active lifestyle. This year’s Wellness Tour will feature five members of the Herbalife Nutrition Advisory Board (NAB) visiting 14 markets and 21 cities across the Asia-Pacific in the month of October. They will share their expert views on how people can make use of the little time they have to make simple lifestyle changes that will enhance their well-being. The Herbalife NAB experts participating in this year’s Wellness Tour include global renowned doctors. Dr. David Heber, a leading expert in the field of nutrition and named as one of “The World’s Most Influential Scientific Minds” by Thomson Reuters in 2014 and considered one of “The Best Doctors in America will be coming to Manila. Dr. Heber, who is the founding Director of the UCLA Center for Human Nutrition at the University of California, Los Angeles, will be conducting a symposium for free to Filipino medical practitioners on October 23, 9am, at the Manila Hotel. The symposium will gather a group of 100 doctors, nurses, physical therapists and medical practitioners. The title of the symposium is “Obesity: More Than Just Being Overweight and Nutrition Forecast for 2020. The following day, Oct. 24, Dr. Heber will be holding seminars for thousands of Herbalife Independent Members in the same hotel. So, is this another reminder that we start and truly commit to a healthier lifestyle? Share your thought and pledges. Dreaming of being a Work-at-Home Professional? It's possible and easy. It's almost 3 weeks since my last post and this is mainly because I have been busy working. After the long struggle of getting DSL installed in our home (which is an entirely different story), I am ready to start working from home again. I did not have any existing clients since I ended all my contracts and engagements before we left Manila. So, the day after we had internet installed, I started looking for an online job again. Good news is that my search was successful and that's the reason for my crazy schedule for the past few weeks. Now, let me share with you some tips and websites to check if you're planning to be a work-at-home professional too. Though LinkedIn may not be that popular as facebook, it is very important that you create a profile. Most companies nowadays research on your professional background through LinkedIn. There you can also find job opportunities and groups that can aide in your career shift. Upwork, formerly odesk is one of the largest hiring portals to find the best professionals. Both local and international clients post job openings in Upwork. They can either be on an hourly or fixed rate. You can go through the job posts and if you find one that interests you, all you have to do is send out a proposal with a bid. This all about identifying what type of service can you offer worth Php 199. By creating a profile in 199jobs, you would be selling your services to prospective clients and constant marketing would also be needed. The good thing about 199jobs is that payment is guaranteed because all clients should first pay for their purchased service. One is not allowed to transact outside 199jobs. The only downside is that they have a minimum amount for payouts (more or less 3 jobs completed.) Honestly, I only had 1 job order and thus, never really got paid for it. I discovered onlinejobs.ph in facebook because I was following their page. Generally, onlinejob.ph is like a "jobstreet" for online work and the process is very easy. Just create a profile and make sure to complete it to ensure that your ID proof is high. ID proof is essential since some jobs would require a certain score from their applicants. Normally, interview invitations are sent via email. Will share more sites on where to look for work next time. Some may respond really fast but on an average, you would need 2-3 weeks to complete all interviews and get hired! Feel free to comment here if you have questions. Good luck in your job hunt.